Residential Retirement Apartments feature a carefree lifestyle with up to 1,300 square feet of living area in a variety of floor plans. An affordable month-to-month lease, with no down payment, and many options from which to choose, lets you enjoy life on your terms. In one of these Apartments, you will enjoy the privacy of your own residence along with the comfort and security of living in a well designed, full-service community. 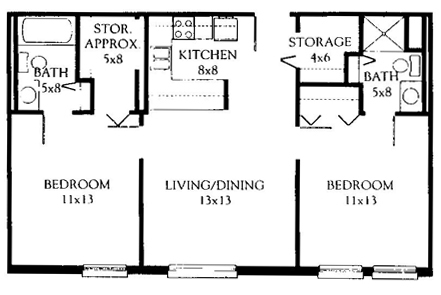 In every apartment, you will find large windows, plenty of closets and storage areas, TV, telephone and computer hook-ups, individual climate control and an emergency call system. 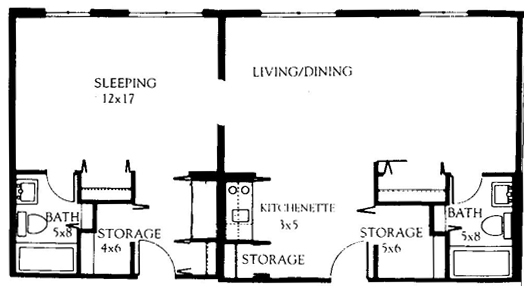 There are two levels of apartment living: Full Kitchen and Kitchenette. Apartments with Full Kitchens are our most independent style. Available in three sizes, this level offers you a choice of meal plans with the flexibility to prepare some of your own meals if and when you choose. 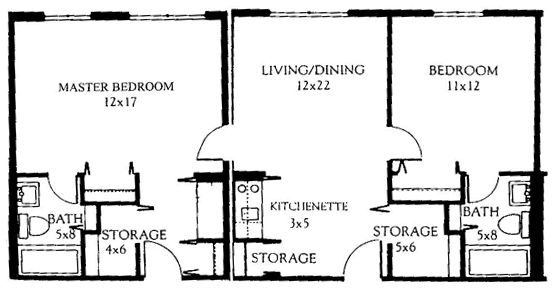 All Full Kitchen apartments include an electric range, a full size refrigerator and a garbage disposal, in a convenient design with lots of cabinets and counter space. 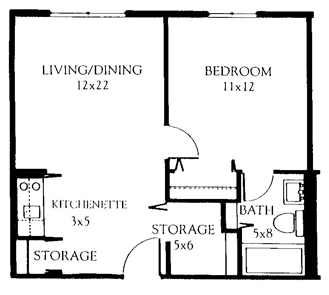 Kitchenette apartments include a convenient hide-away area with an under-the-cabinet microwave, sink, storage and small size refrigerator and freezer. At this level all meals in the dining room are included. Or, if you prefer, you may enjoy a leisurely breakfast in your apartment. In addition to your meal plan, your monthly cost will include housekeeping, linen laundry, non-intrusive daily wellness checks and all utilities except telephone & cable TV. Local TV service is provided. Due to the full licensure of all Westminster apartments, we can offer personal services such as the dispensing of medications or shower or dressing assistance on an as needed basis for an additional fee. 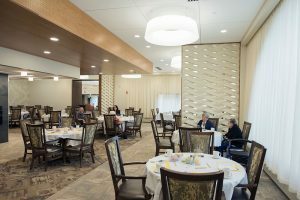 The Windsor Dining Room serves three meals each day with two seating times for daily dinner and the Sunday mid-day meal. The selective menu is on the table for each meal and offers several choices in each of seven categories. The menu is different for every meal, every day. You will find a world of things to do at Westminster. You may choose to attend cultural events at the university or visit the many local shopping areas, restaurants and recreational facilities nearby. 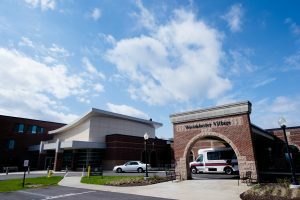 Although you can use your own automobile as you wish, many residents enjoy the convenience of door-to-door service provided by the Village buses. If you prefer to stay in, you can choose to participate in many specially designed recreational, social and spiritual activities. Click here for more information on Activities. Westminster understands that you cannot predict your future health care needs. Therefore, all Residential Retirement Apartments are available on a month-to-month lease. You never commit for any period of time and although you are billed monthly, your cost is always prorated to the day of move-in or the day you vacate. 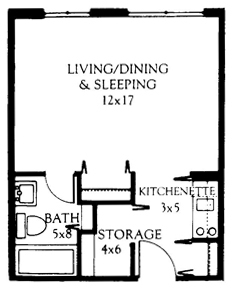 In addition to the Monthly Lease Program, a Full Occupancy option is also available. Whatever plan you choose, you can always move between levels of care at Westminster as your needs change. Use this handy comparison sheet to find the cost of living in your home. 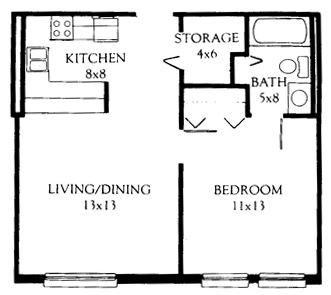 Then contact Marketing to calculate your cost for the apartment of your choice at Westminster. If you’re not ready to make a permanent decision, you can select our Trial Program. You can try any floor plan and we will furnish it for you so you don’t have to move furniture from home until you are sure. You can stay for one, two or three months on the Trial Program and it is also available every winter so you can be safe and warm during the snowy months.